Swagbucks codes are a great way to save on everyday purchases. 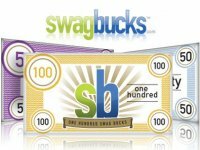 To join the largest free online rewards program head to Swagbucks.com, register for free, earn swag bucks for your online activity, and redeem your reward points for 1,000’s of great prizes! . Get your swag code on! Below are some swagbucks codes to help get you started! SWAG14 – Extra 70 Swagbucks when you sign up at Swagbucks. MandiTeresa – Earn 70 Swagbucks when you sign up at Swagbucks. Bookishcomfo – Earn 70 Swagbucks when you sign up at Swagbucks. GetGiftCards – Earn 50 Swagbucks when you sign up at Swagbucks. File your taxes with TaxACT and enter for a chance to win 500,000 Swagbucks!